One of my favorite Jewish holiday’s. Perfect time for anyone to go all out with their makeup. 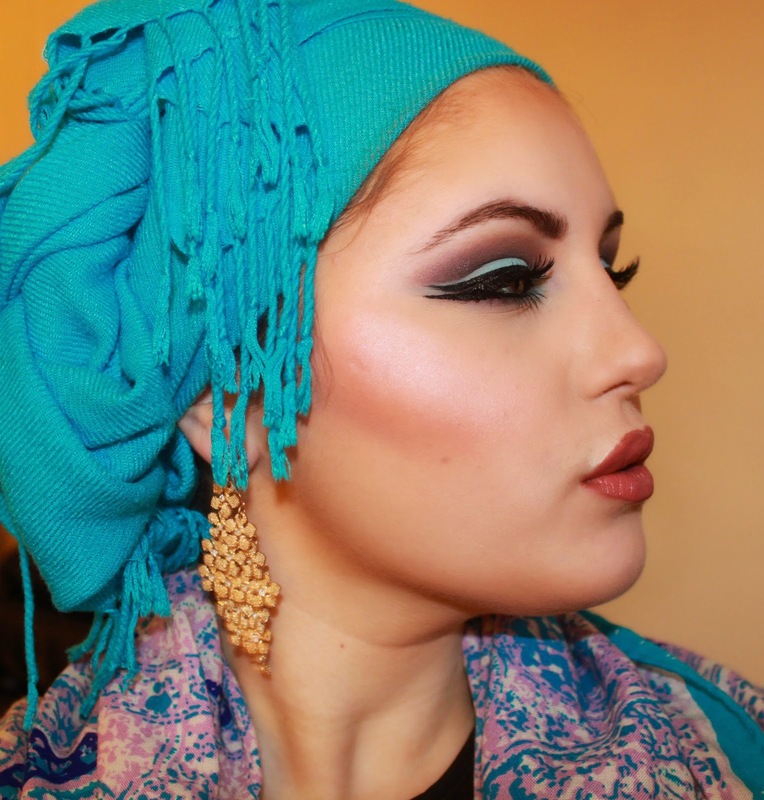 This look is perfect if you are feeling that middle eastern vibe, this cut crease double winged eye look is just a new favorite look for me.I put some nice floral earrings and a electric blue pashmina scarf wrapping my hair. First step is to prime the eyes. I primed them with the Urban Decay primer and filling in my eyebrows with my Anastasia Beverly hills eyebrow powder. I decided to go one shade darker then I usually do, just because this was such a dramatic look I needed to balance off my eyebrows with the darker toned makeup. Then I used MAC eye shadow in “Sketch” (Obssesed with this color). 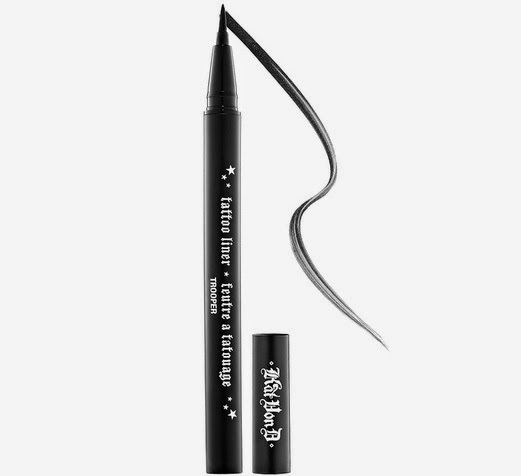 I took Mac’s fix plus and I sprayed it on my hand, and the dabbed an angled brush into Sketch then back into the fix plus, it changed the consistency from dry to wet, making it easier to draw a line on my crease extending the line out. 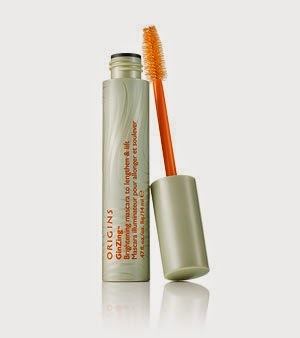 Then I used a very small fluffy dome like brush and started blending this color out towards my eyebrow. Not all the way to the eyebrow, but just far enough to leave some space in between. After I took a fluffier blending brush and started blending it all out. Blending is key to a nice smooth cute crease. 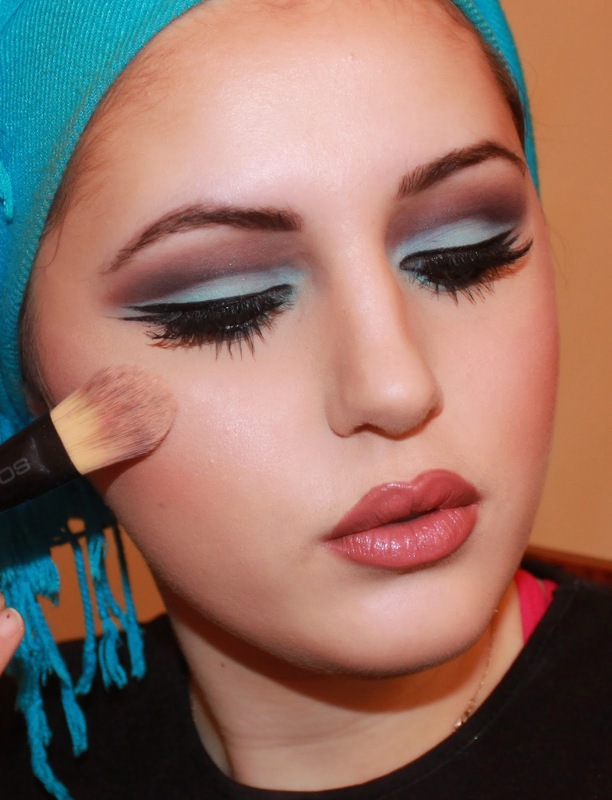 Blending is key to any nice look in general. 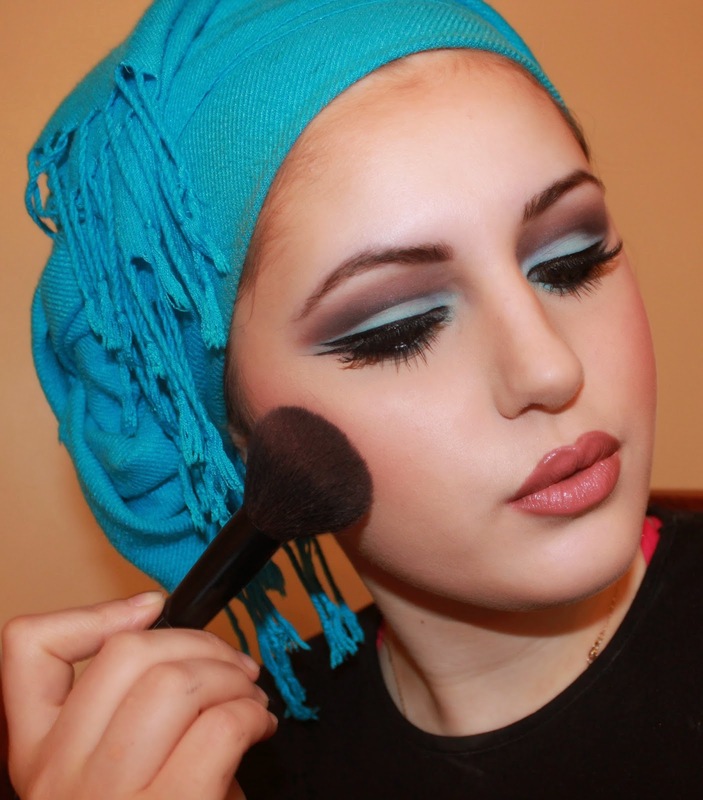 Then I applied a light blue shadow, Sigma’s Creme De le creme palette in the color “Blueberry creme”. It doesn’t have to be perfectly lined up with the crease, we will go over it again to redefine the line. Now we reapply the sketch into the crease again, going over that line we intentionally started off with and blending out wards. After I have finished blending; mind you, I have spent 5 to 10 minutes blending out this color, to make sure it that it doesn’t have a harsh line. I added my liquid eyeliner, Kat Von D’s tatto liner, I love this liner, it doesn’t budge, is a very black and pigmented. Just apply a small thin wing, nothing to dramatic. 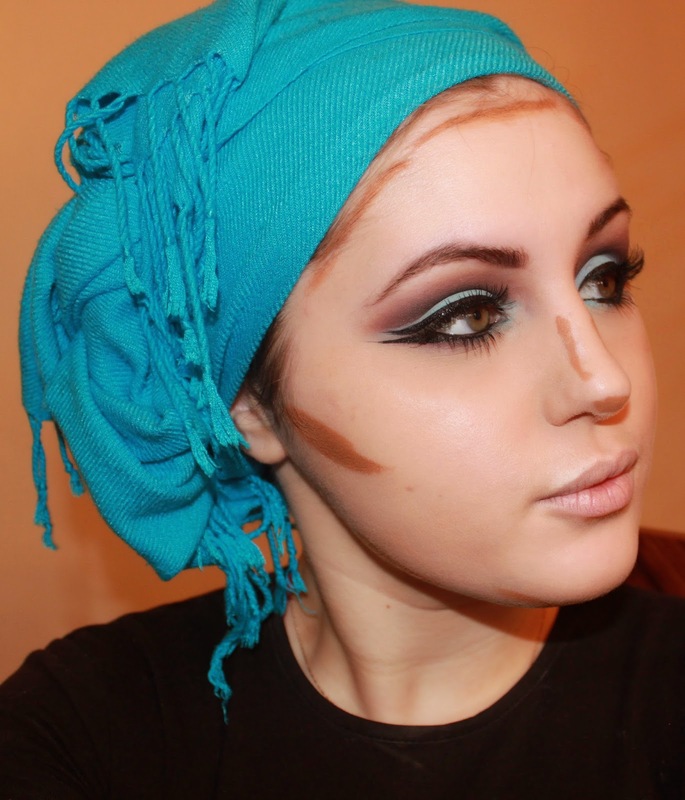 After that i lined my water line, any liner will work for your water line, just make sure it is highly pigmented. 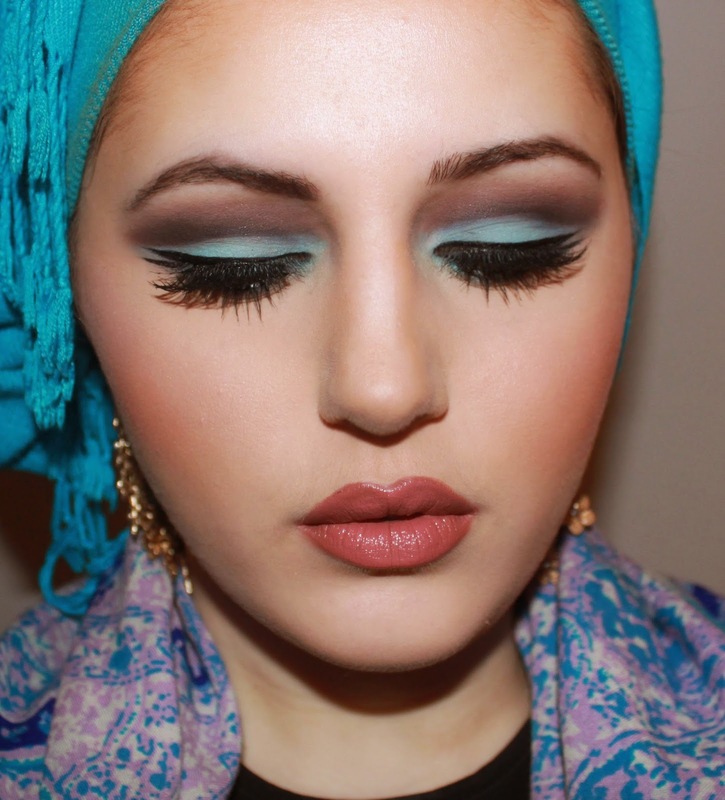 Then I applied a mix of three different blue and green color’s onto my inner corner, to open up my eyes. Then I took sketch and soft brown, adding it to my outer corner on my lower lash line and buff it out. 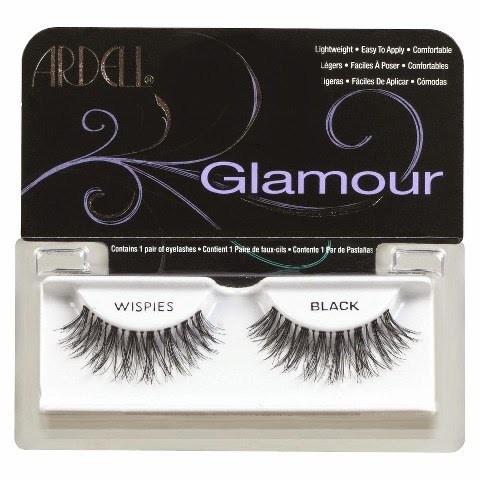 Adding false eyelashes, just makes this look come all together. Lets move on to the face now! I moisturizer my face first, of course! Then some concealer and highlighter! I love using Maybelline Fit concealer and mixing it with a little bit of Maybelline Dream Lumi Highlighter concealer to brighten up my under eye area. When it comes to blending under my eyes, and I already have some makeup applied on my eyes, like now. I use a small fluffy brush to buff it in and give it a soft gradient effect. Then i went back with the same brush I blended out the shadows under my eyes with and blend again. Then I applied foundation and concealer under my eye, then powder with airspun powder to prevent my undereyes from creasing. With my Kat Von D Liquid liner, i applied some liner on my lower lash, starting from the middle and going out wards, not connecting to the upper wing, but leaving 1/8 to 1/4 inch space between the two lines. Take a fluffy angled brush, and start blending, this might be a little bit to much for some, especially if you have no idea what you are doing. As you can see the big difference. Then I applied a really subtle blush, I used my Dior blush in the shade Passion Fruit 533. FYI- this blush is definitely a keeper, I’ve been using it for 2 years now and still have not hit pan! I used my Laura Mercier highlighter and applied it on with a flat foundation brush, on the high points of my cheeks and nose. Then just a little bit on my forehead. And Wallah we are done! Enjoy, I hope everyone has a chag samaech and a wonderful, joyous Purim!